New from Madame Alexander's Disney Showcase Collection, we are pleased to share "Tinker Bell", everybody's favorite mishcievious little fairy! 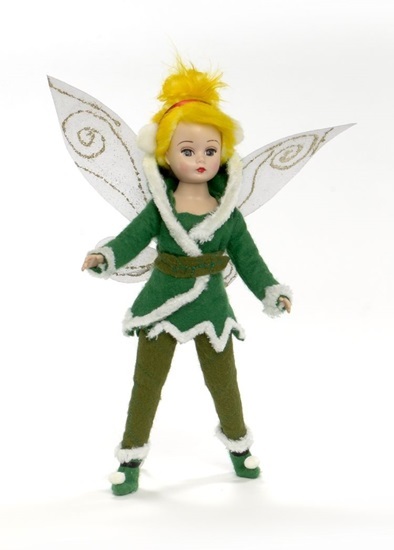 "Tink" is a 10-inch fully-articulated Tinker Bell, with blue eyes and blonde hair upswept into a topknot/ponytail combination. She is wearing a forest green outfit, consisting of a green felt corset, worn beneath a matching long sleeved jacket with a jagged edge that is trimmed with white fur. Olive green pants, with forest green topstitching and a matching belt, compliments the jacket. White glitter organza wings, attached to the belt, is made even more brilliant with swirls of metallic gold glitter. Forest green shoes, with upturned toes, and trimmed with white fur, black ribbon and pom poms go beautifully with the jacket. White pom pom earmuffs and a pink ribbon completes "Tinker Bell's" movie queen look.